A beautiful addition Jan, and a most unusual one too. I have never seen one quite like that, with the black baseplate and the "engraved" lettering. I also do not remember seeing a driver in a post war version.....must have been right after the war. Wonderful photos and a very nice acquisition! Keith Harvie showed the Meccano factory drawings 10251 and 10252 in his praised short-lived Binns Road Gazette, no. 1/6 of Nov/Dec 1999, pages 27-29. I have an early postwar 23c Auto Union with driver, in RED, with black base plate. An interesting feature is the smooth crank case (as on your model), contrary to the grooved crank cases of all the earlier and later models. I hope I can manage to uploade a picture. Ah, interesting to know, Walter, thank you, I wasn't aware of that yet! 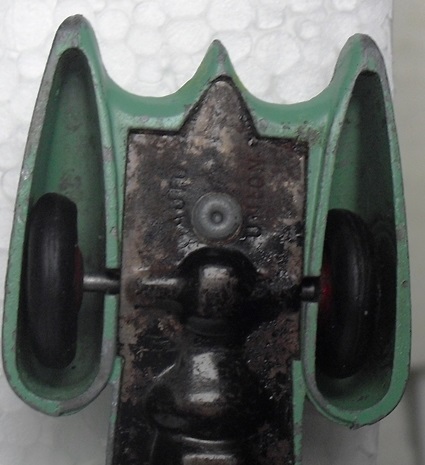 I found a base plate photo of my existing later issue example, a repaint, but the base plate is left as it originally was and - indeed - it has the more grooved crank case. An another photo to show the drivers ! Looks like the 23d box that was sold on ebay france back in 2009, RIchard. I can't make out the date code, can you? My english 23D auto union with its sister, the french 23D. New game : how many differences ? 1. Black base plate "Fabrique en France par Meccano"
And here a view into my Auto Union drawer. Thanks for all these nice details! 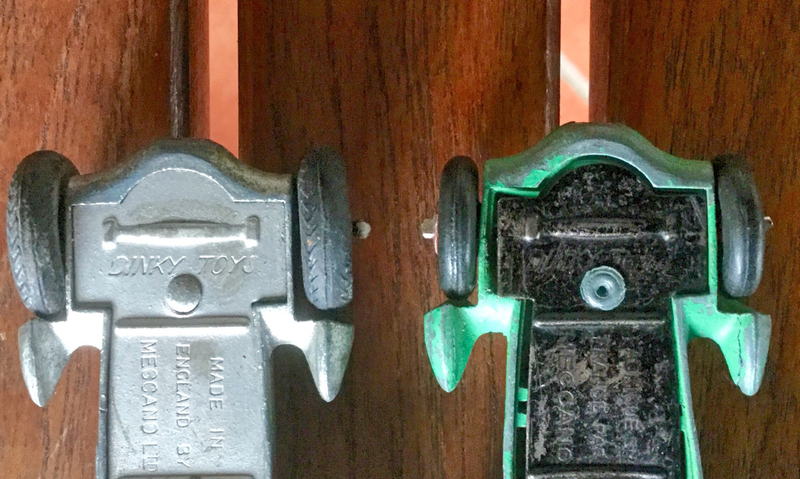 Do also examples occur with clamped base plates - like the Mecedes and Speed of the Wind? Is he mould for the British and the French one the same? (except for the open or closed axles holes). And, is the name 'Auto Union' always present on the base plates? (except of course for the French issue). 1. 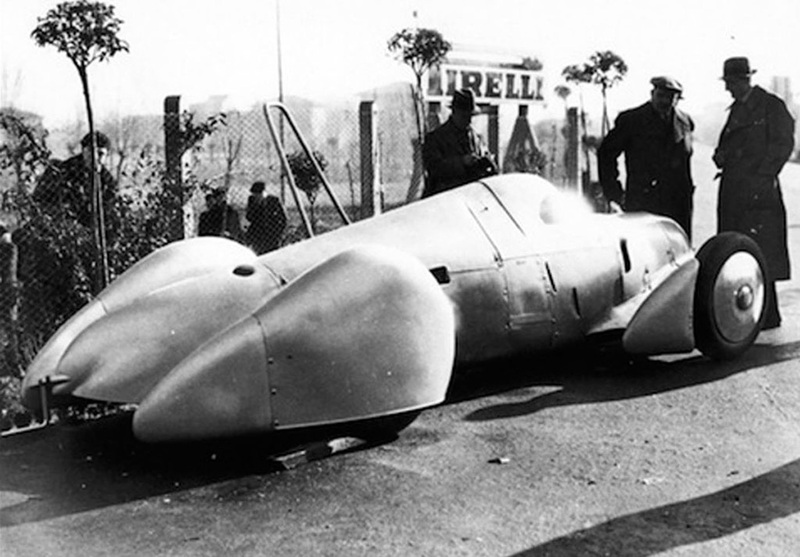 Yes, all the prewar Auto Union have clamped (clipped-in) base plates. Riveting came post-war only. 2. Yes, exactly the same. With slits for the driver, even though there never was a driver in the French issue. 3. No. The prewar issues have no model name AUTO UNION on the baseplate. 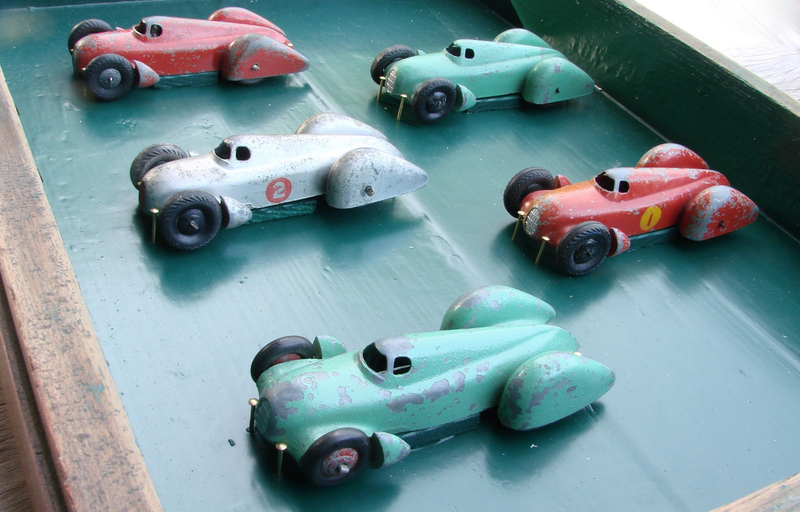 Only postwar, even though the official name was now "large closed racing car". And the French baseplate does have AUTO UNION engraved too. I am sorry but I don't understand what you mean by "clamped base plates". But, I can answer the other questions. a- the font skirt is rounded on my english version and angular on my french version. b- on the bonnet of the french version you can see a "gazoline trap" In fact, it is an injection trace. to your b): My French version is rounded at the front, same as the British issue (see pic). So I think your version suffered a little when molded. As far as your "gasoline cap" is concerned, the British issues have them too, some more, some less. This is indeed an injection trace, as you guessed. the "prominent part" is the crank case and on my French issue it is grooved too, like on the British issue. Perhaps another manufacturing flaw when smooth? Or did the press worn out? 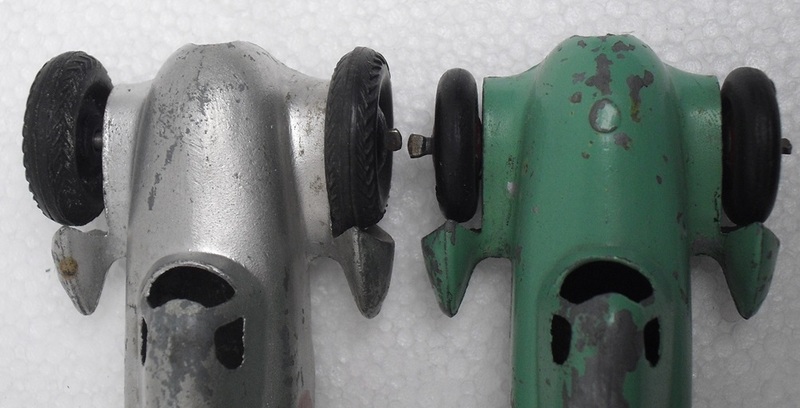 Only the very early post-war British issues have smooth crank cases, then grooved again, like on the prewar issues. No other differences, I'm afraid. The body is exactly the same, the filler cap is on the British issues too, the pointed front end in your model is a manufacturing flaw, both versions have grooves on the crank case. For further details and pictures for proof please see my replies to your above statements. Hope you can agree. Unless there were two versions, as suggested by Jacques. An early version (mine) and a later version (yours). But I have my doubts. Why should they have modified it? But then again, who really knows? According to my documents, it seems that the rounded front was manufactured in 1949 and the angular from 1952. As you, I don't know why Meccano modified it ! 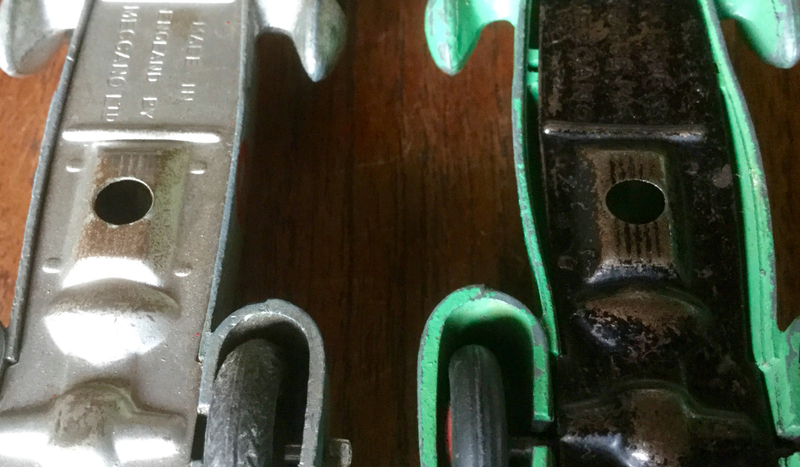 I confirm that my french one has no grooves on the crank case. Now this is interesting! I got a similar feedback from Jacques. It would be great if you could share "your documents" with me in one way or another.Not because I do not believe you, but because I would really like to get to the bottom of it, so to say. 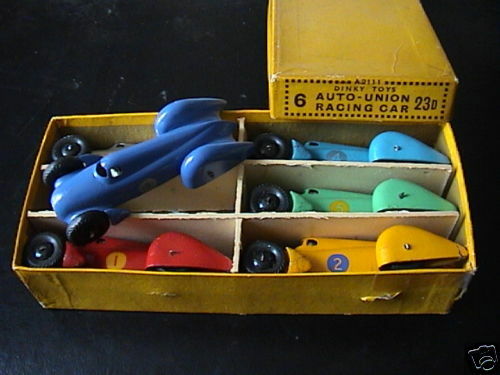 I collect only the racing and record cars, and such an evidence of two "hardware" versions of the French Auto Union (not just "with or without racing numbers" or "red or green hubs" (Ramsay's) would be a real "sensation". 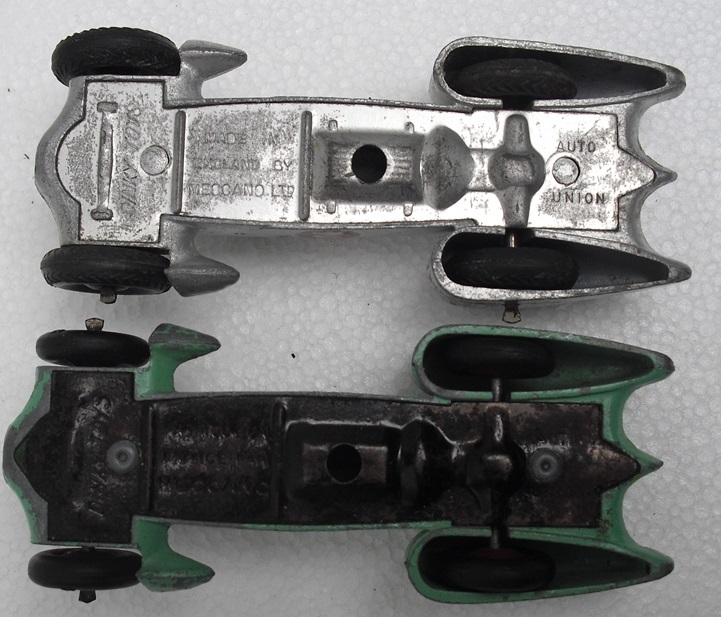 If you visite the website "filrouge-automobile.fr" para " les Dinky Toys anglais assemblés en France" you will see a photo of an auto-union with an angular front. This one as a number(almost obliterated) and no filler cap on the bonnet. My informations come from the "Argus de la miniature" magazine. The angular front version came with red wheels only. Many thanks, Richard (and Jacques), for opening my eyes (again). And I thought I knew it all! Not so. Anyhow, I think we can close this case for now. All that is left for me is to try and get a decent example of this second version of the French Dinky Auto Union record car for my collection. Jan--I mentioned to you that I had recently won a 23d Auto Union, from a seller in the U.S., and was awaiting its arrival. When it arrived a few days ago, I was surprised just how nice it was. From the posted photos on eBay, which were dark, it appeared nice and shiny, but could not see much else. The actual model is in wonderful condition, with just a couple of very minor marks. It is a very early post-war model, much like yours, with the smooth hubs, driver, and the engraved style black baseplate, with smooth crankcase. The only issue are the tires, and I cannot fathom how they got that way, but three of the four are flattened somewhat and also crooked. They are also very hard, meaning they are not some sort of more recent replacement. But I cannot imagine how they got that way, with the rest of the car almost perfect. A couple of the spots are quite flattened, almost like you would expect if they had heat applied. I am going to replace the two front tires, with nice reproductions of the original herringbone style, and will look for a couple of original ones. Overall, I am very pleased to find this....the paint is amazing.....shining and gleaming, for sure it was not played with it. There is a small wear area on the rear of the right front fairing pod. Nice model, congratulations. But with riveted base plate it's early post-war, clearly. Walter-- I got in a hurry when listing that post on my new Auto Union, and I inadvertently said it was an early pre-war model. Obviously, it is an early post-war version, and I fully knew that, but did a "senior moment" and typed it incorrectly.